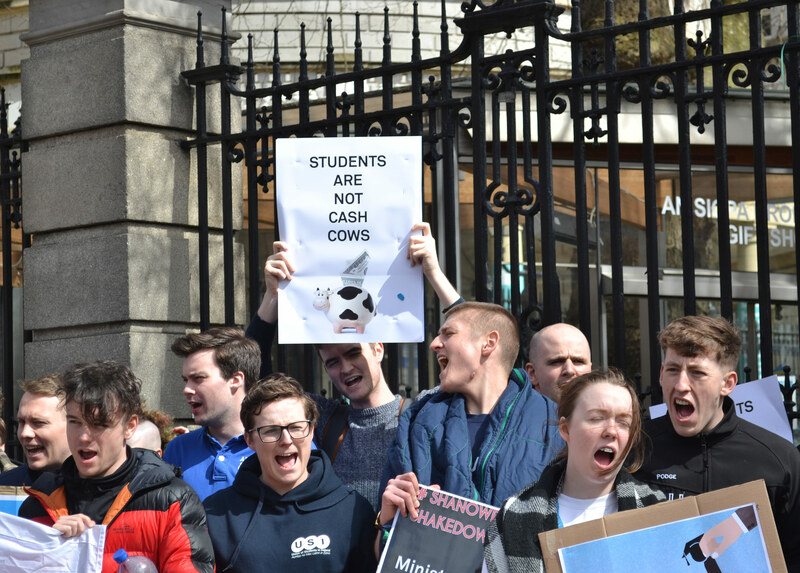 DCU students protested the increase in student accommodation prices outside Dáil Éireann today, alongside other students and representatives from Trinity College and USI. Students at the demonstration, led by the DCU Students’ Union, called for action to be taken by Minister for Housing Eoghan Murphy and Minister for Higher Education Mary Mitchell O’Connor to introduce legislation that puts rent caps on student accommodation. “We’re moving this from just a specific one case to a genuine national movement; to call for real change, to call for amendment to the legislation, to introduce rent caps on student accommodation centres,” said VP Elect for Education and Placement Craig McHugh. “It’s not the same turn out we had for our Shanowen protest, but this is a different kind of demonstration. This is a demonstration to make a bold statement”. Shanowen Square management have not yet responded as to why they increased their rent by 27 per cent for the academic year 2018/19, and shortened the length of the contracts. Minister O’Connor showed her face at the demonstration to say that she was “waiting for Podge to come back with the advice”. “I met him during the Easter Holidays and we will be looking at it. I assure you that it was at the cabinet table today”. “We have advised you to do something in law and we are going to be helping you there. We are also talking to the Attorney General,” said Minister O’Connor.